A few simple notes on boot/rootkits on Windows. 1.1 Older interpretation, or, the original interpretation. 1.2 Additional and newer interpretations (I): physical machines. 1.3 Additional and newer interpretations (II): Systems on Hypervisors. 1.5 Scope of this ridicoulus simple note. 2. The "Helicopter view": Wild bootkits, PoC's, and the problem. 2.1 The main steps in the Early boot. 2.3 Kernel-mode and User-mode kits. 2.4 Some security improvements in modern Windows Servers and Clients. 3.1 The mechanics of the BIOS/MBR/VBR at boottime. 3.3 Compromising Sectors "nearby" the MBR, and the VBR. 3.4 Some notes on how to remove such MBR/VBR bootkits. 4. Some furher notes on a EFI bootkit (Vista/Win7/Win2K8 and later). 2. A few keywords related to System Hardening. There seems to exist a few interpretations on code that's called a "rootkit", and code called a "bootkit". Or possibly the subjects are not clear enough. systemfiles (drivers/modules etc..), so that it is able to perform it's tasks using fundamental systemservices. Usually, it is specifically associated with the boot of a system. like in getting Administrative privilege, or patching/replacing systemfiles etc.. But it is usually not specifically associated with the boot of a system. => A bootkit, or rootkit, is generally assumed to be very stealthy and thus it's difficult to detect. => A bootkit, or rootkit, is generally assumed to aquire Admin control (root) "at some point", which enables it to perform actions with elevated privileges. => The two types are sometimes used interchangeably in some discussions and some articles. But hold on... Seems that I have put already too much emphasis on "systemfile patching..., kernelhooks..., seizing Admin control...etc..". As we will see later this note, people speak sometimes of "kernel mode" and "user mode" boot/root kits. The characteristics listed above, are typical for "kernel mode" boot/root kits, while "user mode" root kits might be happy to live in "userspace" only. Ofcourse, a true "bootkit" must certainly be associated with "kernel-mode", since it will attach itself "somehow" to the "boot" of a system. Note: The kernel/user mode concepts will discussed later in this note. Although "user mode" kits can be "nasty" enough (and even stealthy enough), for now, I think it's more interesting to study kernel mode than user mode. So, I'am afraid the accent will be placed "a tiny bit" more to the "kernel mode" side. However, quite a few people say that the true nuisance is mainly from user-mode Trojans and Kits, which don't care about the kernel or bootstructures. which often is malware that collect passwords, cardnumbers, or any other sort of sensitive data. Especially those bootkits, can be very "successful". So, this is what this short note is about. I hope you like it, but it's probably only useful for an orientation on the subject. Indeed: please be aware, that this is a "soft" document only, without any in-depth technical details. (more or less) the same as the original, but it did additional stuff as well. or loadable modules, or libraries. (which were compromised) were discovered, and were sometimes also classified into the rootkit category. a comprimised utility was activated by the Unix superuser privileges, or it made some use of SETUID bits. "Kit" often referred to the fact that the rootkit was often a set of modified files. that it's pretty good in "hiding itself", and possibly even it's so clever to remove evidence of it's malware practice. is not so dramatically high anymore. But it's certainly not "0". is somewhat higher compared to the traditional Unixes. It's just simply more abundant compared to, for example, AIX. systemprocess, which either activates (parts of) the code itself, or makes it possible to access system services. Here, if we consider the interpretation itself, there seems to be a large sort of "overlap" with viruses, and trojans. For example, complex malware that executes early in the bootphase of XP, might be seen as a boot/rootkit by some experts. Others may just speak of a bootsector virus, like code that activates when the MBR or bootsecor is read or executed. that's able to use an unpatched "Vulnerability in Windows which could allow for Elevation of Privilege"
Again, a typical characteristic seems to be, that this sort of malware is "pretty good" in hiding itself. However, there seems not to exist one striking sentence that really would quicly define a rootkit on Windows. Very "stealthy" code, that is, very difficult to observe using OS tools, or code that even escapes heuristic scanning. Might use many sections that calls ordinary Winapi function, largely done for looking like "innocent" code. Complex code, often using multiple modules, so, in some way, it looks like a "kit" again. Might install itself (partly) in nonobvious locations (possibly even unallocated space). Professional/elaborate code which suggest that "economic crime" is the main objective of the kit (however, it's not mandatory). Possibly uses the MBR or other bootstructures, and may even "hide" clean copies of bootstructures. May use a suitable systemprocess, or vulnerability, to get activated. Uses system privileges when executing (parts of) it's code. a couple of the characteristics as shown in Listing 1 above, especially the first and last ones. from a binary resource of the hypervisor itself. that this could represent a grim scenario. You can make your own LAB or Test environment, and see for yourself that there are one or two things to worry about. all VM's in the cluster of Hosts. Maybe I have something usefull to say on this as well. If so, it will get into this note. In some articles you may find that rootkits are described in such a way, that it seems that they are pretty close to for example "viruses" and/or "trojans". There indeed exists many different terms or names. And, while time progressed, the distinction somewhat blurred. Most common malware types and descriptions. In this very small and simple note, I will only concentrate on malware that gets active in the early bootphase of Windows systems. This thus might also include systems that run on a hypervisor, which somehow inherits it's virtual bios or mbr from the compromised hypervisor. So, in these cases we may view the subject as "rootkits" that acts like "bootkits", or malware that infects, or alters, bootcode or startsequences of the OS. might never be underestimated. It might well be that they turn out to be hard to combat. If you would ask me: they will get a "high risk potential". So, it's interesting stuff to study, and in the process, you prepare yourself with knowledge. However, this short note is probably only usefull for orientation on the subject. Depending on which resource (like websites, articles) you study, you will find that larger and shorter "lists" exists of rootkit variants. When it comes to bootkits, the listings seems to shorten quicly. That's not to say that it is a short listing. Also, from chapter 1, we know that exact definitions are quite hard to make, and sometimes distinctions between malware types is a bit blurred. We need some highlevel info before we try to understand how bootkits might work. will only get alive after the first bootphases. So, AV software in general, is not of much help in the early boot. Ofcourse, after the bootphase is passed, up-to-date good AV software probably is able to detect an installed bootkit. However, you might feel that "you are too late now". But the "threats" can be exeggerated as well. You certainly do NOT need to reformat everyting and reinstall the OS and everyting else. However, regrettably, that cannot be garanteed ofcourse. There exists a number of types of booting a system, like from a LAN, or from disk etc... We are primarily interested in disk based boottypes. For PC "like" systems (like PC's /laptops, and Servers) using Windows, the "MBR based boot" exists for decades now! So, everyting up to XP and Windows Server 2003, was MBR based. Later versions (like Win2K8 Server) can use MBR as well, but they can also boot from EFI firmware. to say, another legitimate bootloader, or malware. which points to the grub bootloader. can be rerouted to another bootsequence. EFI use a different methodology compared to (1), and more about that later. So, "worries" exists that bootstructures "somewhere" might have been altered. is fully up-and-running. However, typically, up to now, kits often places hooks and patches at the early boot. Use EFI with NVRAM to boot from, instead of the older MBR implementation. Use special NVRAM, or a harware chip, that store the signatures and other info, of everything involved in the low level bootprocess. Implementing a "Secure Boot", or "Trusted Boot" which involves verification for EFI objects, all the way up to the boot manager. Full encryption of full volumes. However, bootstructures like MBR does not allow easily for encryption. A distributed system that garantees that Servers in a defined group are, and stay, in a "precise defined state". Launch of a anti-malware driver at the earliest possible stage, which can validate critical code at a later stage in the boot. These are all serious options. In this "ridicoulus simple note", we will discuss the MBR, and EFI boot, in more detail later on. For now, we can say that the EFI based boot (item 1) is unfortunately already shown, not to be "unbreakable". Note that I'am not saying that the "Trusted Boot" has been compromised. Although some claims go around, it's seems very unlikely that it actually happened in a real-world situation. to implement the traditional BIOS/MBR bootphase. In that case, you "fall back" to the weaknesses of this type of boot. Fig. 1. Very schematic representation of the early boot of a Windows system. The picture above is so much simplified, that it's almost faulty: the real bootsequences are really quite more complex. However, we must start somewhere. And the figure above certainly shows the main elements in the early boot. We will describe the various stages of this early bootphase in more detail in chapters 3 and 4.
of the full boot of a Windows system. Note that we again, have distinguished between a BIOS/MBR boot, and an EFI boot. Fig. 2. Very schematic representation of boot of a Windows system. primary defense, compared to a fully booted system. For example, we fully rely on what's implemented in EFI, up to "bootmgr/winload". for malware to get elevated priviliges, or to patch systemfiles (unless an account is logged on as a superuser and is quite careless about his/her actions). Some technical researchers, active in the security field, produce code themselves that can be viewed as "Prove of Concept" malware. all done to find out "how far they can go" and ofcourse to study all effects. and how to become as "stealty as possible". One important question always is: using "what" mechanism, either "as designed" or "as a bug", may lead to "Elevation of Privileges". For example, a user is logged on to his workstation, as an ordinary user and not as an Admin. Then the user clicks a control on a webpage. Is it then possible that the code somehow tries to get Admin rights, and succeeds, and perform illegal actions? As you know, Microsoft regularly publishes security updates which fixes found bugs, to remedy unwanted "Elevation of Privileges". or from the Academic world, or from open communities, or by just a clever person who has just run into the issue. As we will see, especially UAC, split tokens, and manifests, have features that might amaze you. Sometimes, a distinction is made between "kernel mode kits" and "user mode kits". "Kernel mode" code is understood to be code running in "ring 0", and may utilize privileged instructions. The Windows kernel runs in "ring 0", and for example drivers run in "kernel mode" as well, or ring 1 or ring 2. So, if a kit has placed a "hook" (or has "patched") such a module, it may utilize privileged instructions as well. It's quite natural to think that the kernel mode kits are the most dangerous ones. and must use services offered by lower levels. In most OS'ses, people say that applications use system call interfaces, to communicate with lower services (like the kernel). or just start in user mode (e.g. to download something), and later on try to elevate to kernel mode. However, when a kit uses userspace only, most people would speak of a user mode kit. If you still have them: you should probably "do away" all your XP and Win2K3 Servers as soon as possible. Since MS support for XP is over, as of april 2014, there will be no more updates/patches published. It's really fair to say that those versions expose a too large attack surface. However, the "freedom" for e.g. developers on XP pro, was rather "gentle" compared to, say Win7. it's sometimes seen as a real pain. That's simply so, since the official way to get drivers verified and signed, costs them money. However, if you would take a viewpoint from "stability" and "security", the following limited list of features certainly enhances security on modern Windows OS'ses. If you are unfamiliar with those concepts: they are only very briefly touched here, and you are encouraged to do a Web search for more information. I only briefly decribe them here, since it's possible that I mention them in later parts of this note. Supporting "Data Execution Prevention" (DEP)" was introduced in XP SP2 / Win2K3 SP1. Essentially it is a technique which prevents code injected or sprayed in datapages or heaps in memory, that it gets executed. cpu's support it (NX flag). There are several DEP options (from less strict to more strict) possible, which we don't discuss here. As of Vista/Win2K8, you can make use of ASLR, if the code supports it. heaps, and the stack, in the process's address space. This makes it harder for attackers to change pointers or insert shell code. However, if the program cannot handle this, it will crash. As of Vista/Win2K8, an EFI based boot is supported. This means that the former (traditional) MBR/VBR boot (see chapter 3) is not neccessary anymore. As you will see in chapter 3, the MBR/VBR area's, are a very attractive sort of "red light district" for bootkits. On modern x64 OS'ses: drivers (and other critical modules), must be "signed" and carry a supported certificate in order for the OS to execute them. There are plus- and minus points to consider here. But, it's fair to say that it's a good thing for stability and security. listing the SID's of Groups and Accounts, and which "Access Rights" they have (like Read, Execute, Full Control etc..). you can see the "security" associated with that object (the list of access rights of groups and/or accounts). on a File Server, or a printer on a File/Print Server etc..
Rather trivial remark: Never "just" change ACL's that are associated with OS related objects. by the "trusted installer". So, in some cases, even an Admin cannot modify these objects. You should really view it as a security enhancement. However, in some cases, just "some" (old) Program Directories (which you think may be deleted), are owned by the TrustedInstaller as well. That can be a bit annoying. If you need to delete or modify it, then you must change ownership of the objects. However, such actions must certainly be limited. Be carefull not to "mess" with Trusted installer owned objects. User Account Control, or UAC, is a new security component since Win2K8 and Vista (althoug actually earlier versions existed). I'am sure you have "experienced" UAC quite often. switched on/off or put in various levels. In general, you should view UAC as a security enhancement, nomatter how annoying it may be. uses the credentials (account+password) and performs the initial logon. Then it will evaluate the user's token to find what are defined as elevated privileges. If elevated privileges are found, it will filter this token, and "strip" the higher privileges "out". The user might me member of standard group(s) (like Server Operators etc..) with higher permissions, or some system permissions were directly granted to the user. the tokens keep being linked. This is also why some folks speak of "split tokens". are logged on as an Administrator. - If you are an Admin, the message gives a choice to allow the application to start or to prevent it from starting. - If you are a standard user, the user can enter the user name and password of an account that is a member of the local Administrators group. More in depth information on UAC and filtered tokens can be found in ref. 8. EFI or GPT as a "BOOT disk" is not available for XP/Win2K3 (booting is only supported for 64-bit Win2K3 editions on Itanium-based systems). In this note, we have not dealt with EFI or GPT disks yet. For use as a NON BOOT disk, for XP/Win2k3, thus for data etc.., they ofcourse can use GPT disks. Since booting is an important subject in this chapter, it explains why we here focus on XP/Win2K3 with "MBR-Type" disks. BIOS/MBR bootphase of "Intel-like" PC's and Servers running Windows, was, in principle, more or less the same. Today, manufacturers seem to offer primarily EFI machines (with an optional alternative BIOS/MBR traditional bootoption). - As you can see in figure 1 above, the BIOS/MBR bootsequence is illustrated by the first row (the XP/Win2K3 illustration). (Ofcourse, predecessors like NT4, Win2000, used - with minor differences - the same method). 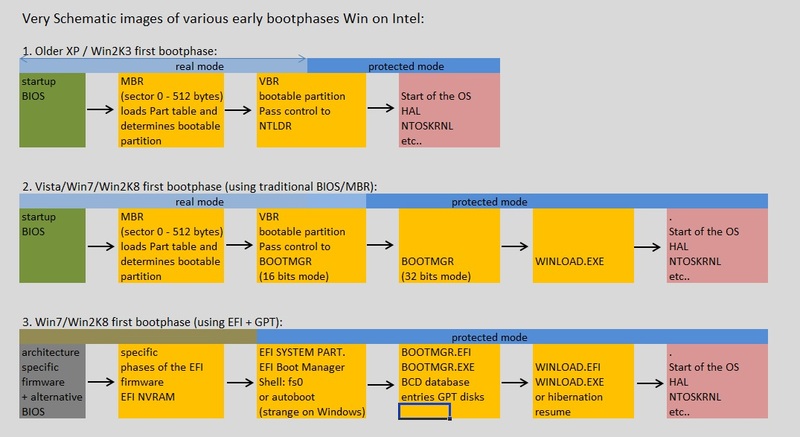 - With newer OS'ses (like Vista/Win7/Win2K8 etc..), there are two main options: again the traditional BIOS/MBR method, or using EFI. These are illustrated by the second and third rows in figure 1 respectively. Now, let's take a look at figure 2. In this chaper, we specifically take a look at the upper row in this figure, that is the BIOS/MBR/VBR boot. The upper row then could represent a XP/Win2K3 boot using MBR/VBR. The lower row then could represent a Win7/Win2K8 boot using EFI. This chapter deals with the bootsequence of XP/Win2K3. after which this (by Microsoft provided) piece of code, switches the machine into "protected mode". In this chapter, we focus on the BIOS/MBR types of machines. So, it just all starts with the "BIOS". When the machine is powered on a BIOS/MBR machine, the BIOS gets control almost immediately. so it can be updated with a new release. In principle, this makes it "writeable". Although measures are in place with BIOS flashes, like crc checks, it has indeed occurred that the BIOS was compromised on specific machines. First we have the "Power On Self Test" (checking main hardware components, like memory etc..). Then we have the "export" of routines (interrupt vectors, "Int") to well defined (low) memory areas so that they can be called (by programs using BIOS). with information added, to whatever needs to be done. This way, video can be manipulated, a disk can be read or written etc..
Next is the optional loading "option ROMs" routines from BIOS'ses on special cards/controllers. And, finally, we have the locating and indentifying of a "bootloader" on a disk (here we assume it's a disk). the list of searchable devices, using the interactive BIOS menu (like altering the preferred order of DVD, Harddisk etc..). However, here we assume the "bootloader" is found on the first harddisk. But in many cases, DOS, while having more sophisticated funcions, it often used the BIOS routines. find that "Int 13-02" means that a disksector needs to be read into memory. If the bootable device is a harddisk, this bootloader is code in the MBR, the first 512 bytes on an MBR type disk. (1). The first 446 bytes of the MBR contains the "bootloader" and some elementary errormessages. 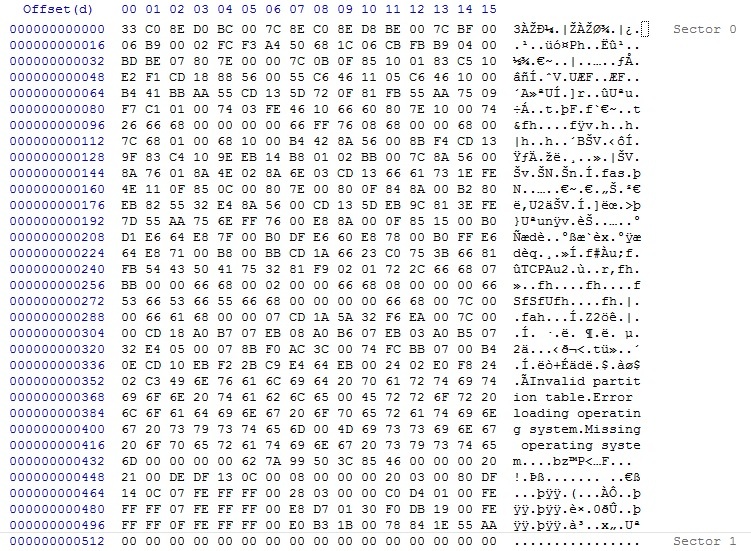 with the first byte of such an entry being the "Boot Indicator" field. This tells the code in (1) which partition is bootable. If that partition is bootable, the boot indicator field carries the value "0x80". There actually exists a number of MBR implementations, but the "PC classical one", is discussed here. Traditionally, the BIOS indentifies the MBR by it's signature at the very end of this 512-byte sector (55 AA). Then it transfers control to the "bootloader" located in the first 446 bytes of the MBR. Control is passed to the VBR, which controls which OS dependent OS loader needs control (like NTLDR). NTLDR does (among other things), load the bootclass drivers, the HAL for this architecture, and the kernel (see figure 2). You should preferrably have read section 3.1 first, before starting this one. By now, we have a "reasonable" idea of the BIOS/MBR/VBR bootsequence (see section 3.1). Fig. 3. MBR of a MBR type disk. It is just so implemented, that the BIOS loads MBR the at the fixed memory address "0000:7C00", and next jumps to it, meaning executes it. Now, suppose a bootkit manages to get hold of Int13, then we know that it can access any sector, so sector 0 as well. It might then modify the MBR, in such a way, that it puts a pointer (a Jump) in the MBR to itself, so that it gets executed "first" at any boot. Also, it might have stored a "good" copy of the MBR at some other sector "nearby", or some other place. Then, once the kit is loaded, a Jump is performed to the code in the good MBR, which then executes in the usual way. So what we have then is the sequence BIOS->BOOTKIT->MBR->VBR etc..
which probably is stored elsewhere. Anyway, by creating a Jump to "itself" in the MBR, this code has managed to be the "first" live code in the system. Maybe it sounds surprisingly simple. What we sketched here, is not much different from the bootsector viruses from the 80s and 90s. where Int13 is easy to use. thereby loading the malware, which then performs as described above. However, once a NT family Windows system is "fully up", disk access goes by protected mode disk drivers. But at the very early "real-mode" bootphase, the above scenario is actually possible. So, it's still true that one should be alert on the fact, if possible "untrusted", and "bootable", external media is attached. to just display "Hello World", and then stops. It's actually a really nice and simple illustration of the theory above. So, direct Int 13, or even the easy "Win9x" "VWIN32_DIOC_DOS_INT25/26" functionality, are not easily available when the protected mode OS is up and running. for using those functions to realize reading and writing "sectors". the perspective of the malware author. other programs, and don't (or can't) use real memory addresses. However, using a FLAT assembler, then it can be used to created programs on 32 bit protected mode platforms. And generally, if we are really talking about XP/Win2K3, any agent using for example "DPMI translation service" might help too. they know all there is to know about the "true" systemcall interface "ntdll.dll" (which even is not fully documented). On the older XP/Win2K3, they also knew what there is to know about shell code, heaps and other memory structures. And more importantly, they want to know all that there is to know about "vulnerabilities" in Windows modules. or non-standard IO calls, can be used, in principle, to read/write any disklocation they want. like e.g. "IRP_MJ_INTERNAL_DEVICE_CONTROL()" etc. In effect: using the regular way. Overwrite/patch existing driver with "adjusted" code. Add a "new" compromised driver and register it. works "fine" with DOS interrupts, if flat thunks to 16 bits are possible. So, under a 32 bit protected mode OS, there are options for controling interrupts. On 64 bit, this game is quite "over". => 1. Sectors "nearby" the MBR. Please be aware that with EFI and GPT, the situation is very different from what is described here and in sections 3.1, 3.2. We will deal with EFI/GPT in chapter 4. So let's return to the "MBR-type" of disks that were used with XP/Win2K3. We have seen the "traditional" MBR in section 3.2, as stored in sector 0. The physical drive (the harddisk), however, is usually partitioned in to "partitions" (or "volumes"). Such a partition will have a starting "boundary" that will always start on a new cilinder (not the one the MBR is located on). In the traditional situation, the sectors "left" from the MBR (so to speak) on the first cilinder, so just before the partition boundary, are a bit special. Again, traditionally, these 62 sectors (numbered LBA 1 to LBA 62) are "officially" empty. Note that here we have 63 sectors, 0 being the MBR, and 62 unallocated. However, on new types of drives, like the "e512" or "Advanced Format Drive", this "empty space" can be a lot "longer". start at sector 2048. This then means about 1MB of empty space (which is not large ofcourse). -Traditionally, sectors 1-62 (while sector 0 is the MBR) are "officially" not in use. -In a more modern setting (on a MBR-type disk), the first 1MB (or other "round" number of 32K), are empty, while 0 is the MBR. while the "rest" of that bootmanager (stage 2, and possibly more stages) might be located in sectors near the MBR. Be aware that other "special" sectors might be found too, in LBA 1 to LBA 62.
from the MBR, those sectors just contains "noise". However, it's important that we know about such "tactics". So, a "live" bootkit might have stored code and data in those sectors near the MBR. => "Partition Boot sector", or the "Volume Boot record". From what we have seen before, the "Partition Boot sector", or the "Volume Boot record", might begin at the first new cilinder boundary. if indeed that Partition is the "active" (bootable) Partition. been placed on that Partition. However, again, the first few sectors are "special" again. The first sector is the Volume Boot Record (VBR), or the Partition Bootsector. But, depending on the type of filesystem of that Partition, the VBR might use several sectors on the Partition. But let's concentrate on the first one. In this sector, a small amount of OS dependent "IPL code" is present, meaning on XP/Win2K3, that this code transfers control to NTLDR. The BPB (see below) provides information for the executable portion of the VBR to be able to locate the NTLDR file. If you would use Vista/Win7/Win2K8 with MBR-Type disks, then this code transfers control to BOOTMGR. IPL is a general term, and means "Initial Program Load", which just is code for starting the bootloader of the Operating System (like NTLDR). For refreshing your memory, and getting the facts straight, just take a look again at figures 1 and 2 above. As another important datastructure on the Partition, the "BIOS Parameter Block" (BPB) should be considered as well. Many folks see the BPB as part of the VBR. Others treat it as an apart structure. Ofcourse, it's stored in sectors. at the beginning of the Partition, containing the "VBR" and "BPB". That's alright as well. It's length is, among others, dependent of the type of filesystem (like FAT, NTFS). It holds various "administrative" fields, like "the number of FAT's", "the number of Hidden Sectors", "MFT first cluster number", and many more. The VBR/BPB, or "bootblock", is much more complex than the relatively simple MBR (of an MBR-type disk). However, if the bootkit wants to do something "usefull" with the information, it should be able to interpret certain fields. the VBR/BPD can be read (and possibly altered), interrups can be utilized, and read/writes can be done. Install data and code in empty sectors in the cilinder where the MBR sits, or install in the Partition. A bootkit could do much more than wat is listed above. But, what you see here, are actions that can be relatively easy "implemented". (2): Simple example of altering the MBR to boot to only display "Hello World"
(5): UAC and IE protected mode. (9): Example of a site with "drive-by install"
(10): Simple, effective, analysis of "drive-by install"
You might want to take a look at this short note.